Fleetwood made it back-to-back wins but needed a dramatic late fightback in Manchester after letting a 22-5 half-time lead slip. 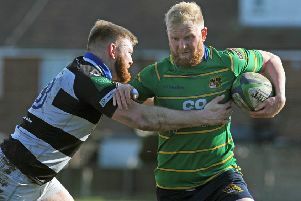 Aldwinians surged ahead in the second half only for two late tries by Karl Bowling, sealing his hat-trick and the man of the match award, to secure the points for Fleet. This first away win of the campaign followed the Melbourne Avenue victory over Hawcoat Park and means the Green and Golds are up to ninth in the table, having lost their opening two games. Fleetwood’s Jake Brocklehurst was delighted with the win despite his side losing momentum after the interval. “Karl really came into his own with those two tries in the last few minutes, when we’d gone 30-22 down. “We don’t have too much strength in depth at the moment but we do believe in ourselves. “Phil Wood has stepped up from the third team and Alex Ogden joined us from the Colts. Mike Kelly has had to play out of position but we’ve held our own.